It’s a sad, Mother Hubbard-sad, type of day ………. when the almond jar is empty and when a peek in the freezer reveals there aren’t any more of these sweet-salty-crunchy Honey and Sea Salt Roasted Almonds left. We love them for snacks (WARNING! – extremely addictive! 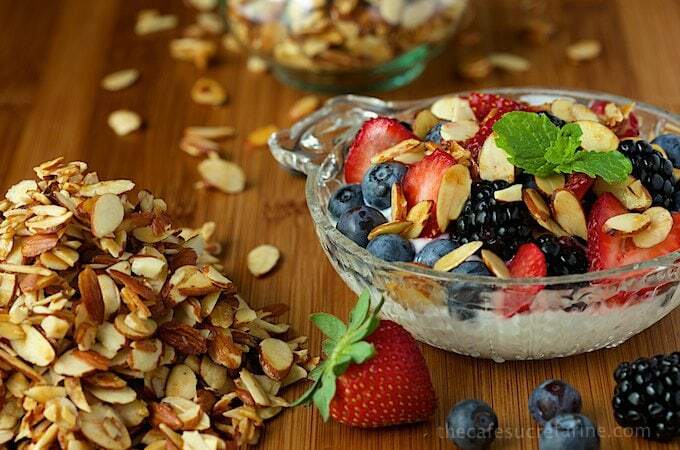 ), sprinkled on ice cream sundaes, in salads and on oatmeal. 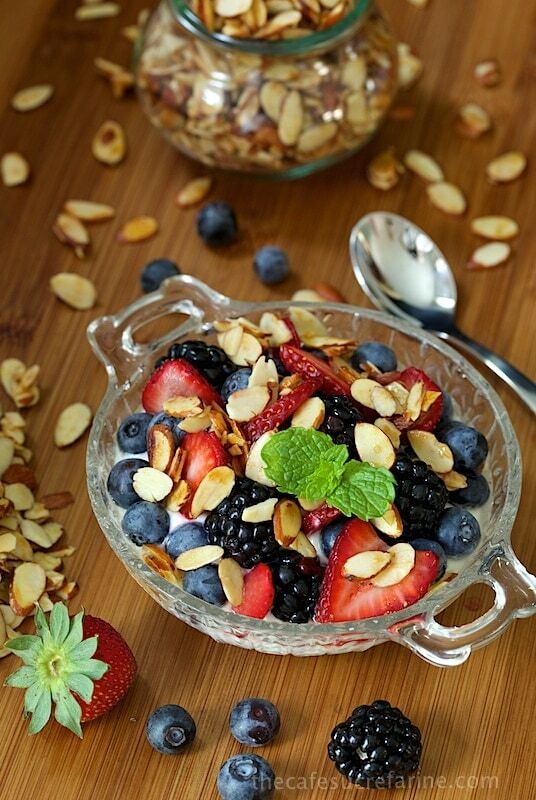 But our favorite way to enjoy them is scattered on top of our morning Greek yogurt and fresh fruit, a simple and delicious alternative to granola. Oh, they make a nice appetizer too. Either on their own or like this: place a block of cream cheese on a pretty plate. Take a couple spoonfuls of your favorite jam (this is mine right now) and add a splash of Sriracha sauce. 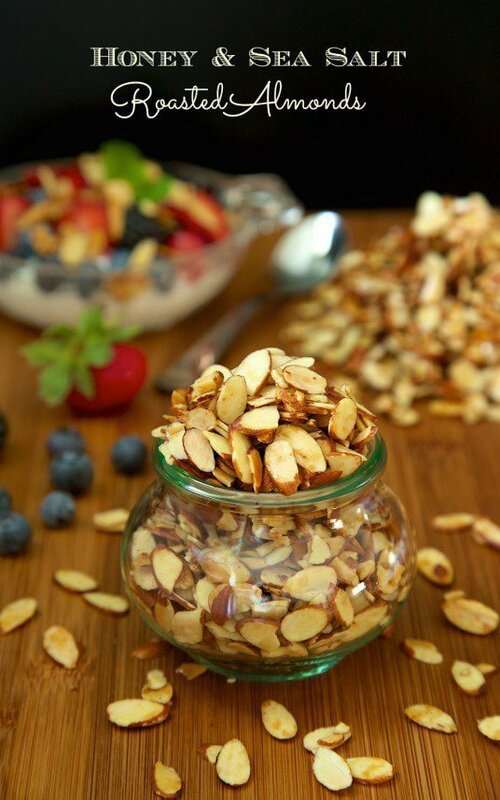 Spoon the spicy jam over the cream cheese and sprinkle with these Honey and Sea Salt Roasted Almonds. Garnish with a bit of finely chopped basil or parsley and serve with crackers, for a beautiful (you don’t have to tell anyone it’s spur-of-the-moment) before dinner treat. I love that they can be made in less than 30 minutes and can be stored for a month or more in the freezer. Somehow, they never seem to last that long though. After cooling, store these delicious nuts in an airtight container for a few days, or in the freezer for several weeks. 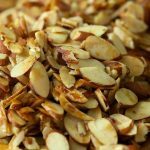 Once you try them, I have a feeling it will be a sad, Mother Hubbard-type of day for you too when the almond jar is empty and a peek in the freezer reveals that there aren’t any more of these wonderful Honey Sea Salt Roasted Almonds. Sweet, salty and super delicious. So simple too, they're done in less than 30 minutes! Preheat oven to 350˚F. Line a sheet pan with foil or parchment paper for easy clean up. 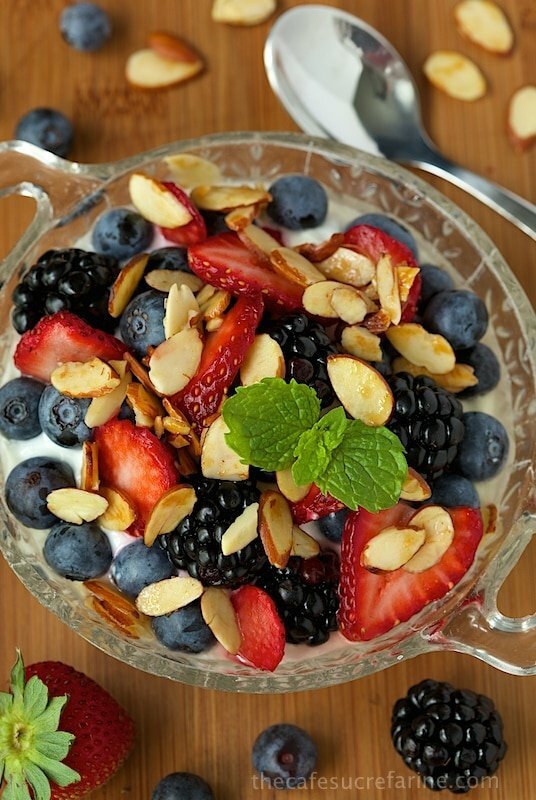 Add almonds to prepared pan. Combine coconut oil and honey in a small microwave-safe bowl. Place in microwave and cook on high power for 30 seconds. Drizzle mixture over almonds and stir gently to coat. Place in oven and roast for 22-25 minutes or until golden brown, stirring gently to redistribute every 5 minutes. Remove from oven, sprinkle with a bit more sea salt (to taste) and stir gently. Allow to cool completely on pan. Store in an airtight container for 2-3 days or in the freezer for 4-5 weeks. *When you use flaky sea salt in a recipe like this, rub it between your fingers as you add it, breaking up the large flakes as you sprinkle it. If you have a Costco near you, they sell large bags of slice almonds for a very reasonable price. 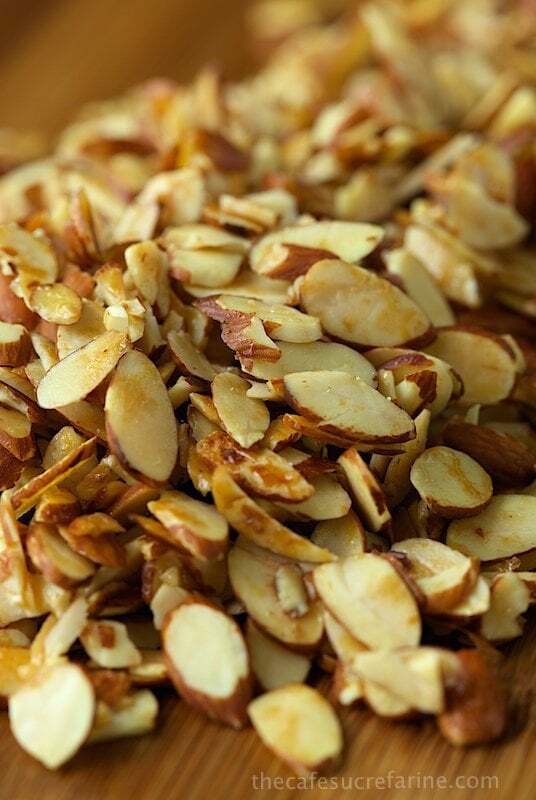 Trader Jo's also always has a great buy on sliced almonds. I made these today to replace a prepackaged mix of honey roasted almonds and cranberries that I use as a favorite salad topping and they turned out amazing. This was exactly what I was looking for when searching the net. Thank you! Thanks for letting us know Stephany, so happy you enjoyed them! Received some sliced almonds tonight for Christmas. Why is the prep and cook time 3 hours and 15 min? Hi Chris, I switched to a new recipe plugin in the fall. I have to go into each of my almost 1000 recipes and adjust the time. I’m working on it but haven’t gotten to all of them yet. I have now corrected this one. Thanks. one question, do you start with raw almonds or roasted almonds? Hi Amy, the almonds I use are raw almonds with no added ingredients. Enjoy! awesome! thanks so much. I just took my first batch out of the oven and they smell awesome! when i was making them i noticed at the bottom of the recipe it says add more salt, is the 1/2 tsp of salt supposed to go in with the honey and oil? Thanks for the recipe! Great on salads and oatmeal! You’re very welcome Kaye! They are so good, and dangerous too! yumm umm just made these to top a sweet potato casserole..cant stand all the sugars in the traditional ones…this is absolutely perfect!fast a just the right amount of sweet!